Talented five-year-old Another Truth, whose Kentucky Derby winning sire I’ll Have Another was sired by Wilgerbosdrift’s G1 winning stallion Flower Alley, made news at Hanshin on Sunday when he won the G3 Antares Stakes over 1800 metres. Under jockey Takuya Ono, the gelding ran on to score a half-length win over Grimm, with London Town a further neck away in third spot. Another Town has now won six of 15 outings and he is out of the Fuji Kiseki mare Kyoei Truth. His sire I’ll Have Another was relocated to California in 2019 where he is currently standing at the Ballena Vista Farm. United States’ Champion 3YO Colt of 2012, I’ll Have Another won five of only seven outings, with his wins including both the 2012 Kentucky Derby and Preakness Stakes –the first two legs of USA’s Triple Crown. Flower Alley, the sire of I’ll Have Another and 39 other black type performers, has had just five local runners thus far but three of these have been placed. 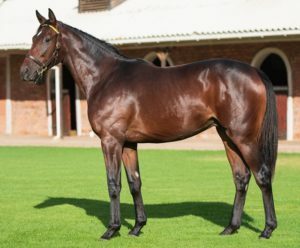 A Travers Stakes winning son of champion sire Distorted Humor, Flower Alley has 25 lots on offer at this month’s Emperors Palace National Yearling Sale including a half-brother (Lot 59) to high class performers Wagner and Nassa, a colt (Lot 104) out of SA Oaks winner Ilha Bela, and a colt (Lot 105) out of a stakes winning daughter of multiple champion US sire Giant’s Causeway.